Bridget Campbell is more interested in music than men. In fact, she may be the only girl in the Scottish lowlands who isn't looking for a husband. But when her estranged grandfather's health begins to decline and he asks her to move into his castle, Bridget is introduced to a handsome Highlander who becomes a rival for her attention. Although perfect strangers, there's a connection between Bridget and Aidan MacLeod that she can't ignore. Can she stand up to the men in her life who are pressuring her to settle down? At first uneasy about leaving her parents' modest home to live at Ty-Runach Castle, Bridget feels pressured to accept her grandfather's invitation. Robert had distanced himself from her mother when she married a man from a rival clan. The ancient feud between the MacDonalds and the Campbells broke her family apart, but maybe Bridget can heal the rift? But someone clearly doesn't want her at the castle. Strange noises in the night and a frightening attack nearly send Bridget running from the keep. And then there's Aidan. Rumors of his reputation as a ladies man convince her to stay away lest she become the highlander's conquest. Yet her rebellious heart beats faster whenever Aidan is near. A single kiss lights a fire within that threatens to consume her. Can she resist Aidan's advances and rein in her runaway heart? I purchased Her Rebellious Heart a few months a go as a free download on Amazon, and since we went to the Scottish festival this weekend, I wanted good a historical fiction with roots in Scotland. I was pleasantly surprised that this was clean, and the setting was authentic. I loved the descriptions of the North Sea, the crumbling castles, the tartans and feuds between clans. My only complaint is that at times the Scottish dialect was present and others times it wasn’t. Do not becomes “dinna” etc. Also, the flow could have been more smooth and the main villain definitely needed to be fleshed out more fully. It seems like the author cut the conflict short. It reads more like a novella than a full story. With more editing and filling out of story line this could have been much more. I did enjoy the surnames in the book…main man Aidan MacLeod carries my ancestral clan name! Overall, if you want a short historical Scottish read as a small taste of the place, this may be a good pick, but I would wait until it goes up for free again. Marian McBride is an American author of Scottish descent. When she feels like honoring her roots, she plays her Celtic harp, but not as well as she’d like. Occasionally, she sings along, usually when she wants to punish her family. Marian is not a particularly good Scot. She doesn’t enjoy haggis or bagpipes, but she does love a good Highland Games, particularly when men in kilts do the caber toss. 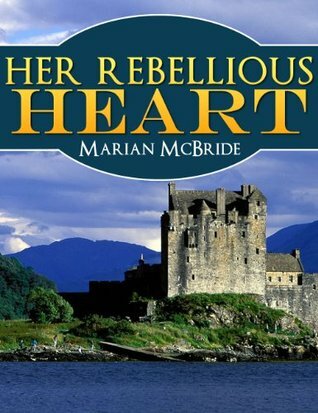 “Her Rebellious Heart” is Marian’s sole novella. She hopes by showing some Scottish pride in her writing, her clansmen will forgive for not visiting home often.